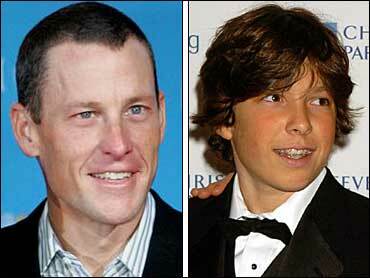 Lance Armstrong spent Wednesday morning comforting 13-year-old Will Reeve, less than two days after his mother, Dana Reeve, died of lung cancer. "I would say that his spirits were pretty good considering that, in the last 18 months, he's lost his father, his mother and his grandmother," Armstrong told syndicated entertainment show "Inside Edition." Will's father, Christopher Reeve, died in October 2004 from complications from an infection. The former "Superman" actor was nearly totally paralyzed in a horse-riding accident in 1995. Armstrong said he became close to Will during his mother's illness and the two spent time together during the last few months. "I love hanging with him," the cyclist said. "I never thought I'd say that about a 13-year-old, but he's a great kid. He's a big sports fan. He's an athlete himself. Will is not your normal 13-year-old. He's a smart, well-adjusted, mature, humble kid." Dana Reeve was her husband's constant companion and supporter during the ordeal of his rehabilitation, winning worldwide admiration. With him, she became an activist in the search for a cure for spinal-cord injuries. With all eyes now on her, Dana Reeve became the public face of the Christopher Reeve Foundation devoted to finding new treatments for paralysis — until last August 9, when she stepped into her final role. She announced she had lung cancer. The Christopher Reeve Foundation is yet to announce plans for a funeral.